The Asyra bio-energetic screening system provides you with information about the energetic origins of your health and wellness challenges and advance quickly to the appropriate solutions. This is done in moments, non-invasively, and with no practitioner bias. The Asyra Pro is the ultimate tool to achieve truly personalised and effective health and wellness plans. The Asyra Pro is the most advanced, flexible and user-friendly bio-energetic screening system available today. Asyra tests the energetic response of the client against a wide variety of test signatures that cover everything from the meridian points relating to internal organs, food preferences, environmental contaminants, nutritional factors, toxins, emotional patterns and many more. The Asyra Pro simply guides ‘us’ the practitioner, using ‘you’ the client’s own responses to a multitude of possibilities. Informational ‘imprinting’ provides a re-inforcement of the test and a digitally-imprinted, custom-made energetic carrier delivers energetic signature via low-power laser or bioenergetic remedy to support your body’s healing. Whilst Asyra testing is relatively new, it builds upon much older methods of no-chemical testing. According to Eastern medicine, the body has a system of energetic channels that carry the life energy. These energetic pathways are like a blueprint that the body builds itself on. If the blueprint is incorrect, the processes don’t flow properly. The Asyra provides a way of asking questions of the body and mind quickly and efficiently by measuring the energetic responses of the body electrically at points through the skin. It is very easy to take energy for granted when we have it, but only notice it when we dont’! Our busy lives often leave us feeling “out of sorts”, tired and lack lustre. We chose to ignore certain issues in our lives (stress, anxiety, grief, illness etc) because we don’t have time to address them. This will bring about conflict, tension and disharmony within the body and is the perfect opportunity for energy blocks to form. If not addressed, the blocks will create an imbalance in our systems and over time dis ease will manifest. Our bodies have the natural ability to self heal. A normal healthy body will de-toxify naturally, but in order to do so, energy needs to flow freely in and around the body. Balancing your energies balances your body’s chemistry. providing a further source of information in addition to those obtained from case history, questioning or observation. apply that information directly in support of healing by way of built-in informational feedback. The Asyra software contains digitally-encoded information relating to a wide range of mental, physiological and emotional factors. 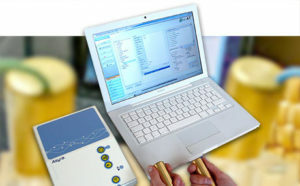 The signals are output by the Asyra hardware as electromagnetic signals during testing. Using a simple and safe low voltage circuit formed by holding two brass cylinders, the response of the body to those signals is recorded. What is the nature of the information obtained? What exactly is meant by 'energetic' in the contact of health testing? The functioning of the human body is governed by informational signals. Some of these, such as the instructions for making proteins encoded in DNA are recognised by modern science. The epigenetic factors – how our experiences in life affect gene expression – are just beginning to be understood. It is likely that there are many other communication mechanisms at work that have yet to be explained scientifically. Biology is a very young science. The existence of control mechanisms beyond genetic determinism is not seriously disputed by modern science, but its implications have not filtered through to medicine in practice. This is a result of resistance to change and because it is not yet clear how to employ the knowledge in systematic treatment programmes. When we obtain responses from a bioenergetic testing device, the information is a mixture of commentary on the physical, chemical, emotional and mental state. Indeed, part of the skill of the practitioner of bioenergetic testing is to consider the information that comes from the system and decide how to recommend an individualised health and wellness programme. Is is the same as bioresonance? Yes. Bioresonance systems are operating along the same principle, although many of them are much more limited in their application compared to Asyra. Resonance and ‘frequency’ are often used interchangeably. We prefer the term ‘informational signatures’ as in truth, the recorded and encoded signal may interact with the consciousness in a more complex way than a single frequency or simple wave-form. Who can be tested on the ASYRA? The only people who can’t be tested on the ASYRA are people with pacemakers or epilepsy devices that use batteries. It is safe for babies and children however, it is not recommended for pregnant women in their first trimester. No, but let us be clear about definitions here. ‘Diagnosis’ is derived from a Greek word meaning to ‘discern or distinguish’. In the modern medical context, this means to take a set of symptoms presented by a patient and state that they fit better into the category for disease A, disease B or perhaps disease C. In this way the medical practitioner can choose appropriate treatment, and it is important that he gets it right because the treatment for disease A might have quite negative consequences for a disease B patient, especially if it is surgical. Asyra testing does indeed ‘discern’ only in that it records a completely individual set of responses to signals. This may assist a holistic practitioner the approach that is characteristic to such disciplines: “treating the patient, not the disease”. Information obtained may is NOT used to make a diagnosis in the traditional sense, rather it is used as another tool in the toolkit to providing a further source of information in addition to those obtained from case history, questioning or observation. So what do the results signify? The Asyra test is identifying items to which the body / mind system can learn better adaptive behaviours. These items may be as diverse as foods, pathogens, emotional patterns, colours or nutritional and pharmaceutical agents. How do we use this in our practice? We can proceed down a number of paths. Firstly, we can follow the recommendation – feed the informational signatures highlighted by the test back to the body. The Asyra provides us two ways of doing this: by creating an imprinted informational remedy (similar to a homeopathic remedy), and by feeding the information via a safe low-energy laser. That much is simple, and is often quite clearly effective. However, most practitioners choose to use the Asyra results to inform other aspects of a wellness programme according to their particular expertise. Most commonly this means nutrition, herbs, homeopathy, acupuncture, osteopathy or emotionally based therapies. The practitioner working in this way can utilise the very flexible database and reporting system on the Asyra to run the tests required to investigate different parts of the health picture and to inform other types of treatment within their training. The Asyra essentially helps the practitioner to find clues about how to make progress, though like with all detective work, some clues are more important than others. The Asyra test itself is very quick, but should allow a minimum of one hour an ‘essentials health consultation, with some more in-depth consultations requiring more time. A consultation includes a thorough case history in addition to the bio-resonance screening, a discussion of your health challenges and concerns, as well as your customized treatment plan going forward. Do the tests correlate with symptoms? However, the real value of a bioenergetic testing or bioresonance system is to reveal underlying patterns that are able to help change the dynamics of the system. These, by definition, are not the symptoms themselves. They may be recognisable as things closely associated with a symptom, or they may not be. When we want to help a client undo patterns that have been ingrained into the body over years or decades, the process can be seen as stripping away ‘layers’. Bioenergetic testing using the Asyra, especially using the Comprehensive Analysis at the heart of the system, reveals the body’s first priorities for healing, and those may or may not correlate with the main symptom that the client is presenting. As we peel away more layers, different causative aspects of the health problems reveal themselves for healing. Rarely if ever will a test repeated two minutes later give the same set of responses as the first time. This is a critical point. As the system is revealing the body’s response to informational signals, and response to information is instantaneous – the response to the same questions will be different if you run the test again. That’s not the same as saying that a physical symptom has gone away – just that the body-mind has taken account of that information and can therefore adapt to it in any way it sees fit. That adaptation may take a while to promote a physical change, and indeed the same information may need to be fed back to the body repeatedly if aspects of the client’s environment or habitual behaviour override it. The imprinted remedy helps with this process. How do I take the energetic remedy? The energetic signature can be via low-power laser or a bioenergetic remedy is available in liquid form for most people which requires taking a specific number of drops (determined by the Asyra). Or the remedy can be given as pollutes (small pills) which dissolve under the tongue. In order to assess your progress, follow-up appointments are recommended. healing often occurs in layers and once a layer is treated, the next can be addressed. It is usual for clients to have a follow-up appointment 3-6 weeks after their first consultation, depending on the recommended time given for taking the remedy.